Counterpoint is defined as two or more simultaneous melodies that maintain their independence while still forming a harmonic relationship. A single instrument like classical guitar can perform counterpoint with three or four lines seeming like a single part. However, rock guitarists seldom do this for a variety of reasons, but that doesn’t mean it can’t be done. 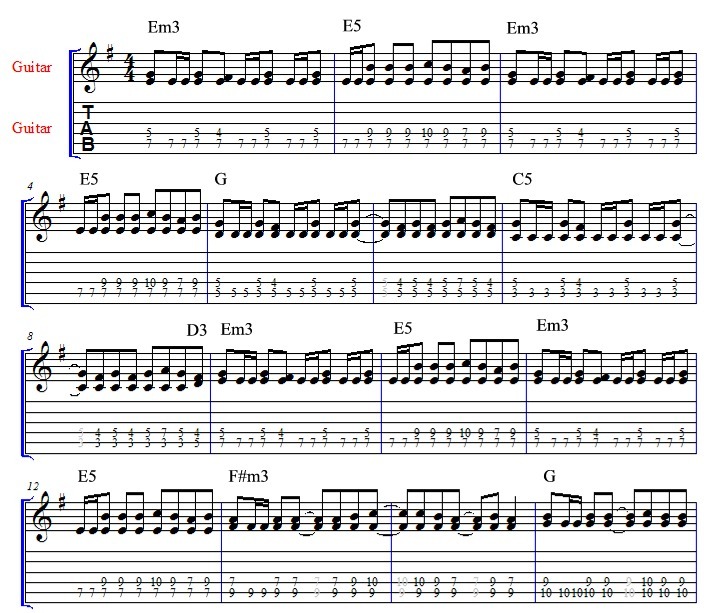 In Part One and Part Two, we examined intervals, how to write riffs with them, and different ways to melodically ornament them. The two main intervals were fifths and thirds, with each having neighbor and/or passing tones. Now we’ll go further to using mixed intervals and introduce two basic ideas in counterpoint: oblique motion and contrary motion. So far we’ve been using three implied chords: E minor, D major, and C major, in that order. The lower line has also been E, D, and C, and the main interval has either been thirds or fifths. What we’ll look at now is retaining that bass line, but changing what interval is above it. Take a look at Example 1. The upper part remains on G while the lower line descends. As this happens, the G forms an E minor third with the E below it, and when the passage ends, a fifth with the C below it. 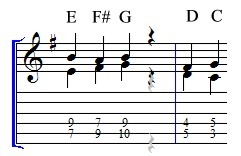 G is a common tone for E minor and C major (it is in both the first and last chords). 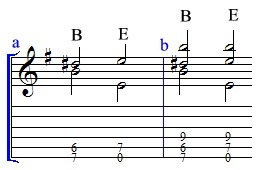 In between at measures 5-6, while the lower note is D, G seems like a non-chord tone. After all, the notes of D major are D, F#, and A. There’s no G, but we’re playing it anyway. There are two interpretations. One: G is a non-chord tone that works with D because G is in the chord before and after it. This makes the temporary dissonance of G not being in the chord smoother. Two: The chord has changed from D major to being G major in second inversion (i.e., the fifth, D, is the lowest note). G major is spelled G, B, and D. Any time you’re playing a perfect fourth, the higher note is the root, as if it’s a root-fifth-octave voicing without the lower root (Example 3). In previous articles, when using thirds or fifths, we were always doing parallel motion, which means the two notes were a third apart on the first chord and remained that way as the notes moved to other chords (Example 4). Fifths were always a fifth apart. There are two independent parts. A good use of oblique motion is to perform a V-I progression, since the fifth note of a key is in both chords. In E minor, that note is B. The V chord of B major is B, D#, F# and I chord of E minor is E, G, B). You can hold down the B while alternating the E with a D# (Example 5). When two lines move in opposite directions, it’s called contrary motion. This technique is useful for switching between a third and fifth in particular. A fifth can collapse inward to a third if the lower note moves up a step and the higher note falls a step. In doing this, C and G become D and F# respectively, so a fifth becomes a third and the chord changes from C to D. The reverse works just as well, so a third can expand outward to become a fifth (Ex. 6). Another application in E minor or major is for the V – I progression, B major to E, as in Example 7. Here, the low B drops to the open E while the D# rises to another E, so a third becomes an octave. We can also add another B on top and leave it there for both chords (Ex. 7b). This sounds richer. If we combine the ideas in this article with the ornamentation ideas of the last article, we arrive at a riff like that in Example 8. This uses mixed intervals, upper and lower neighbor tones, and parallel, oblique and contrary motion. Notice the last beat of measure 8, where C5 collapses to D3, which then rises in parallel to Em3. Hear the mp3, where the bass guitar line outlining the G chord. Counterpoint is a simple way to add depth to your parts for a more spacious, richer guitar riffs, especially when combined with mixed intervals. In subsequent articles, we’ll go through the song “Motif Operandi” from my album, The Firebard, riff by riff to see these applications and variation techniques in practice.